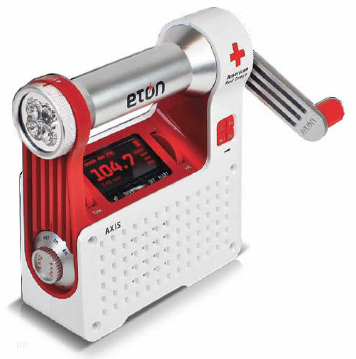 The Eton Axis is your one piece emergency solution. This self-powered safety hub gives you AM, FM and NOAA weather an LED light source and USB cell phone charger. It receives all 7 NOAA weather channels plus Alert. It even has a built-in clock function with alarm. There is a white LED light source plus a red LED flashing beacon. 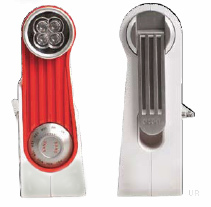 This device can be powered via the aluminum crank hand turbine into the supplied internal NiMH battery, or via three AAA cells (not supplied) or external AC adapter (not supplied). There are gasketed jacks for earphones and for auxiliary input. 6.375 x 6.625 x 2.125 inches 1.6 lbs. Copyright 2011-2014, Universal Radio, Inc.